1.1. Neither Assertive nor Cooperative - Low emphasis placed on both achieving personal goals and preserving relationships. 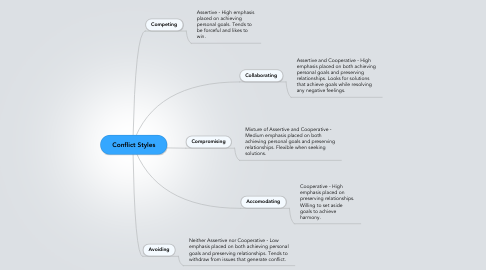 Tends to withdraw from issues that generate conflict. 2.1. Mixture of Assertive and Cooperative - Medium emphasis placed on both achieving personal goals and preserving relationships. Flexible when seeking solutions. 3.1. Cooperative - High emphasis placed on preserving relationships. Willing to set aside goals to achieve harmony. 4.1. Assertive - High emphasis placed on achieving personal goals. Tends to be forceful and likes to win. 5.1. Assertive and Cooperative - High emphasis placed on both achieving personal goals and preserving relationships. Looks for solutions that achieve goals while resolving any negative feelings.